It is important to remember that physical objects are not given as primary data. What is given is only a set of sensa; and a sensum, in Dr. Broad's language, is something "non-referential". The Berlin based Austrian artist Stefan Schuster has chosen Aldous Huxley's book The Art of Seeing (which in the German translation bears the subtitle "What We Can Do for Our Eyes") as the point of departure for his solo exhibition. The artist is interested in the book not for the medical or biological aspects of vision but for perception-i.e. the perception of an object with or without an understanding of its significance. Although his recent work reflects an increasing interest in writing and language, Schuster is also concerned with shifts in form and content. He uses books as raw material, cuts them up and reconstitutes them in a different form. Transformation, not destruction, is a central theme. The object of the book, which consists of paper and printing ink, takes new shape. 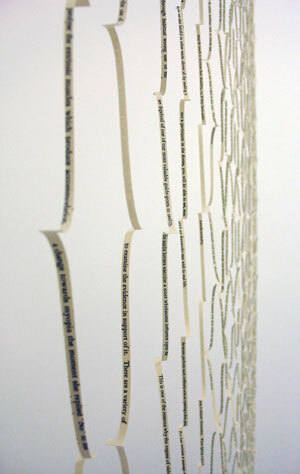 Carefully cut into long, thin strips, the pages hang from the ceiling. The viewer literally walks through the book, but its legibility has been destroyed. In its new formation the object still conveys what a book is: a collection of printed words. Schuster thereby creates a unique form of poetry, in which the meaning of the words is secondary. Similarly, he presents other works, which only deal with the relationship between black and white-with blackened lines that do not reveal the words below. Black bands cross-cross panels as if they were the result of a printing press malfunction. Stefan Schuster's works add a new dimension to our ordinary experience of language and writing by removing content and leaving language to form.